All i2x0/i60x instruNet controllers are compatible with 32bit Windows ≥ Xp Sp3 Operating Systems. 32bit compiled software support the i240/i60x (not i200/i230) instruNet controller on 32bit and 64bit (via WoW64) Windows ≥ Xp Sp3 Operating Systems. 64bit compiled software (e.g. LabVIEW64, MatLab64) support i240/i60x (not i200/i230) instruNet controllers on 64bit Windows ≥ 7 running instruNet Software ≥ 3.6.
instruNet ≥ v3.7 (2016) adds support for i60x products. instruNet ≥ 3.6 (2015) adds support for 64bit compiled software (e.g. LabVIEW64, MatLab64, end user C/C++/VB x64) on 64bit Windows ≥ 7.
instruNet 3.0 (2010) thru 3.5 (2014) is compatible with Windows ≥ Xp Sp3 computers running 32bit or 64bit Windows (via WoW64). This software supports i200 pci, i230 pcmcia, and i240 usb controllers. Version ≤ 3.5 is NOT compatible with 64bit compiled software (e.g. LabVIEW64, MatLab64). The older instruNet software version ≤ 2.0 (≤ 2009) is compatible with Windows 95/98/Me/Nt/2k/Xp/Vs computers running 32bit Windows; yet is not compatible with 64bit Windows. The older v2 software only supports the i200 pci and i230 PCMCIA controllers (not the i240/i60x USB). Version ≥ 3.0 can load an instruNet .prf settings file that was saved with instruNet software ≤ 2.0, yet not visa-versa. The i60x device requires instruNet software ≥ v3.7 and a 32bit or 64bit Windows Computer running Windows ≥ Xp Sp3 (i.e. Windows Xp/Vs/7/8/10). The i240 USB controller requires instruNet software ≥ v3 and a 32bit or 64bit Windows Computer running Windows ≥ Xp Sp3 (i.e. Windows Xp/Vs/7/8/10). The instruNet i4xx Card Cage hardware requires instruNet software ≥ v3 (not v2) and a 32bit or 64bit Windows ≥ Xp Sp3 computer (not Windows ≤ 2k). The	i4xx	Card Cage is compatible with all i2x0 instruNet Controllers (i.e. i200/i230/i240). instruNet ≥ 3.6 software C/C++/VB interface (e.g. 'iNet_INT.c', 'INET_Interface.vb') supports 32bit and 64bit compilations (target CPU is "x86" or "x64") via Microsoft Visual Studio ≥ 2010. Target Computer (end user) and Development Computer (programmer) must be Windows ≥ 7 (2009). To compile both Debug and Release, and both 32bit and 64bit versions of the examples, select Batch Build in the Build menu. Compiler output is directed to 'Win32' and 'x64' folders. 64bit compiled programs run on a 64bit version of Windows ≥ 7 (not 32bit) via 'system32/inet32.dll' after installing instruNet version ≥ 3.6. 32bit compiled programs run on a 32bit Windows ≥ 7 computer natively via 'system32/inet32.dll'; or on a 64bit Windows ≥ 7 computer via 'SysWow64/inet32.dll'; after installing instruNet version ≥ 3.0. Interfaces files are supplied in instruNet folders 'Visual C & C++' and 'Visual Basic', within '..Program Files (x86) \ instruNet \ Programming Interfaces \'. The "Load_instruNet_Driver()" function loads the correct version of the inet32.dll file; therefore the programmer does not need to concern himself with the above issues. instruNet 3.0 thru 3.5 software C/C++/VB interface (e.g. 'iNet_INT.c', 'INET_Interface.vb') supports 32bit compilations (target CPU set to "x86", not "x64") via Microsoft Visual Studio .Net Version ≥ 7 (2002). The resulting 32bit .exe file runs on a 32bit Windows ≥ Xp Sp3 computer natively; or on a 64bit Windows ≥ Xp Sp3 computer via Wow64; after installing instruNet version ≥ 3.0. Interfaces files are supplied in instruNet folders 'Visual C .Net' and 'Visual Basic .Net'. End user C/C++/VB executable programs that were compiled for use with the older instruNet version v2 software (via v2 C/VB interface files) will run (without recompiling) on 32bit Windows ≥ Xp Sp3 computers that contains the v3 software. In other words, end user software compiled with the v2 interface files (e.g. inet_int.c) will run properly on a 32bit computer to which instruNet ≥ v3 had been installed (i.e. iNet32.dll version ≥ v3). 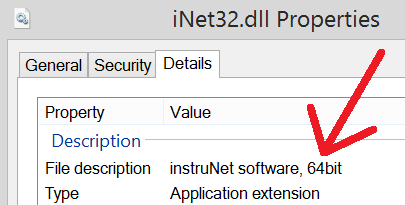 instruNet places 99% of its code into one DLL file called 'iNet32.dll". There are two versions of this file in instruNet software ≥ v3.6, yet both versions have the same name (to help connect to other software). One is internally compiled as a 32bit file and the other as a 64bit native file. Both are functionally the same. The only difference is the 64bit-native version connects to 64bit software (e.g. LabVIEW64, MatLab64) on 64bit OS computers. The 32bit version works on both 32bit and 64bit Windows ≥ Xp Sp3 computers and only connects to 32bit software. The 64bit version runs only on 64bit Windows ≥ 7 computers and connects only to 64bit software (e.g. LabVIEW64, MatLab64, or 64bit native end user C/VB program). To see if an "iNet32.dll" file is 32bit or 64bit, select the file in Windows Explorer, right-click Properties, click the Details tab, and view the "File Description" field. If it says "instruNet software, 64bit" (as shown below), you have a 64bit file; otherwise, 32bit. If you are running instruNet World software and want to see what version iNet32.dll you are currently inside (iNet32.dll is instruNet World), select ABOUT in the HELP menu. If it says "64bit native", you are in the 64bit version. Alternatively one can click the TEST tab (bottom of window), click the SEARCH button, and view the "instruNet Driver" row. The instruNet i100 Data Acquisition box is compatible with both v2 and v3 software and is compatible with i200/i230/i240 controllers. If you can attach an i2x0 controller to a computer, then the i100 will connect to it. The older i200/i230 controllers are compatible with instruNet v2 software running 32bit Windows 95/98/Me/Nt/Xp; and are also compatible with instruNet v3 software running 32bit Windows Xp Sp3, Vs, 7 and 8 (yet not Windows ≥ 10). The older i200/i230 controllers are not compatible with 64bit Windows and there is no way the end user, via Wow64 or any other method, to change this. For details on installing i200/i230 controller cards into Windows 95/98/Me computers, click here. Note that the i230 card never supported Windows NT. To download the older version 2.x software, click here . Almost ALL computers manufactured ≥ 2009 are not compatible with the i200/i230 controllers. For details, click here.